Impression Material is essentially an extension of the Styrofoam treatment. This 2-part silicone base putty material, when blended together, will cure to a rubber-like consistency similar to that of the frog. The blended Impression Material is placed in the bottom of the foot with an Impression Pad taped over it. A mold is made when the horse stands on the Impression Pad. After the material has cured it can be trimmed away from the sensitive areas and placed back in the foot under the a shoe and pad. The material is then used to transfer support through the pad evenly to the frog, bars and sole. 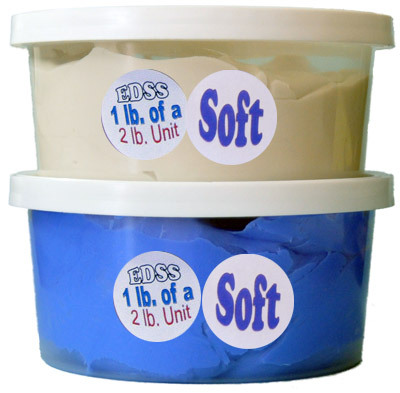 This soft blue material won't end up hard like the regular and firm can.